JAKARTA, Indonesia, September 25, 2013 (ENS) – The government of Indonesia is offering incentives to support the production of more low cost green cars after Toyota declared its commitment to supply the country with environmentally-friendly vehicles earlier this month. Indonesia’s government is offering these incentives to ensure the country becomes the production hub for them within the Association of Southeast Asian Nations, ASEAN. “The Ministry of Finance will ensure that the low cost green cars regulation is put in place,” Anshari Bukhari, secretary general of the Ministry of Industry told the Antara News Agency on Tuesday. He said the ministry hopes to implement the policy by the end of this year. To qualify under Indonesia’s low cost green cars category, a car must have an engine capacity less than 1,200cc and minimum fuel consumption of 20-22 kilometers per liter. 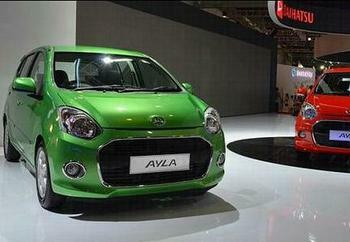 On September 9, Indonesian automaker Astra launched two such models – the Toyota Agya and Astra Daihatsu Ayla. The Agya and Ayla are the first vehicles to receive certification under the Indonesian government’s Low Cost Green Car program. The program supports the widespread adoption of affordable and fuel-efficient cars, with certified vehicles eligible for reduced taxes. The Agya was planned and developed by the Toyota Group company Daihatsu Motor Co., Ltd. and is produced by Astra Daihatsu Motors, Daihatsu’s subsidiary in Indonesia and Indonesia’s largest automaker. The Toyota Agya and Daihatsu Ayla will be produced at a new plant in Karawang, 70 kilometers (43 miles) east of Jakarta, completed at the end of 2012. A total of 30,000 units are expected to be delivered by the end of 2013. “We are very pleased to be able to launch the Agya today. We are confident that the Agya, a car designed specifically to meet the needs of Indonesian consumers, will be popular,” said Toyota Astra Motors President Director Johnny Darmawan on September 9. Astra is a diversified group that serves as the distributor for Peugeot, BMW, Isuzu, and Nissan Diesel as well as Daihatsu and Toyota. The Agya and Ayla join other vehicles on the Indonesian market jointly developed by Toyota and Daihatsu, such as the Toyota Avanza and the Daihatsu Xenia. In launching the Agya and the Ayla, Toyota and Daihatsu aim to develop a new market segment comprised of first-time family car owners. At the Indonesia International Motor Show 2013 which opened September 19 for 10 days in Jakarta, Daihatsu is exhibiting eight new models under the banner “Compact ECO Mobility Best Friend.” In a technological booth, the inner workings of the Ayla are demonstrated. With the development of a production hub for low cost green cars, Indonesia hopes to become the leading ASEAN car producer, ahead of the current leader, Thailand, according to an analysis by Indonesia Investments, a firm based in Jakarta and The Netherlands. Total car sales in ASEAN in 2012 surpassed the three million mark. The two largest contributors to these sales were Thailand, with 1.3 million cars sold, and Indonesia with 1.1 million. Currently, Thailand is the largest car production hub in the ASEAN region, both in terms of production rate and domestic sales, despite having only 60 million citizens compared to Indonesia’s 240 million. In line with the region’s economic growth and growing population, total car sales in ASEAN are expected to pass four million vehicles in 2013 and five million in 2014, says Indonesia Investments. Another plus for Indonesia is that the efficient use of fuel by low cost green cars is expected to limit domestic oil demand. As Indonesia has shifted from a net oil producing nation into a net oil importer, expensive oil imports put pressure on the country’s trade balance. The government wants to make Indonesia the production hub for low cost, environmentally-friendly cars ahead of the start of the ASEAN Economic Community in 2015, a single market and production base for all ASEAN member countries. Low cost green cars are expected to become popular in the ASEAN region due to the region’s economic growth coupled with its large population. Proponents of the policy argue that if the Indonesian government had not provided incentives, another ASEAN country could have become the production hub for low cost green cars. Even so, the government’s low cost green car incentives have met with strong opposition from those concerned that thousands more cars on Indonesian roads will overburden the country’s weak infrastructure. More traffic jams could result if public transportation and infrastructure are not quickly improved, so opponents of the low cost green car program say that investments should be directed instead to the infrastructure sector rather than to production of the environmentally-friendly vehicles. Infrastucture improvements are taking place. On Monday, a week ahead of the APEC Economic Leaders’ Week in Bali, Indonesia’s President Susilo Bambang Yudhoyono opened the 12.7-kilometer-long toll road on the island of Bali. 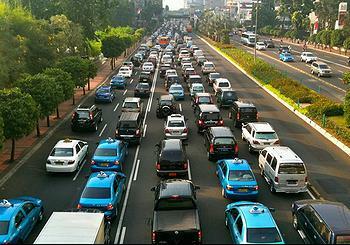 The operator of the Bali toll road is Jasamarga Bali Toll, a consortium of state-controlled companies. The road, which runs almost entirely on viaducts above the sea, provides a north-south route from the city of Denpasar to Nusa Dua, as well as a branch to Denpasar’s Ngurah Rai International Airport and a connection to the port of Benoa.